Draft horses can be used for farming work or ridden under saddle. The World Equestrian Festival held in Aachen, Germany, hosts Cart Horse Day, in which dozens of draft horses participate in jumping, dressage and other under-saddle events. With their calm temperament and larger size, drafters are good choices for tall and large riders, as well as nervous riders who need a steady, willing mount. Two American draft horse breeds used for driving and pleasure work are the American Cream draft horse and the Spotted draft horse. The American Cream typically stands around 16 hands, about the size of a tall light horse breed. It is noted for its beautiful cream color, and snowy white mane and tail. The Spotted draft horse has exceptional endurance and makes an excellent trail horse. Like the American Cream, they tend to be about 16 hands tall, making them a comfortable mount for the average sized rider. Europe produces many draft horse breeds, but especially noted for under saddle work is the Friesian. With their flowing black manes, tails and leg feathers, this horse breed from Holland has been used in competition and pleasure work for decades. The British Gypsy Vanner horse pulls heavy gypsy caravan wagons and also serves as a pleasure mount. Some smaller draft horse breeds pull sleighs and carts, and also act as riding mounts. The Austrian Haflinger horse actually is the size of a small horse or pony. Haflingers are hard-working horses that also are extremely calm and trustworthy, making them good children's mounts. The Norwegian Fjord is a small draft horse descended from horses once bred by the Vikings. It is one of the oldest horse breeds and closely resembles the wild Mongolian horse. 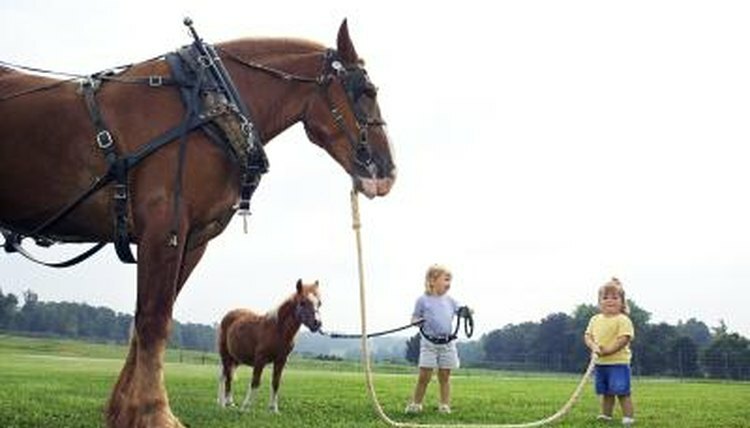 The heaviest draft breeds include the Suffolk Punch, Clydesdale, Belgian, Shire and Percheron. Among these breeds, the one least suited to under saddle work is the Suffolk Punch. It's enormous size and muscling would make it a very uncomfortable mount. Belgians, Clydesdale, Percherons and Shires are used occasionallyas riding mounts. These breeds also are crossed with Thoroughbreds and other light horse breeds to produce draft horse cross offspring that are especially prized as sport horses for show jumping and upper level dressage.